New Year’s always ended with a bang, when I was partnered up with my best friend, Cece Alexandra Rose. She wasn’t just the demon queen – she was the party queen. I expected no different this year – my suitcase packed with flashy, skin-tight dresses and Louboutin heels that I could dance all night in. My mission was to get utterly wasted before the clock struck midnight on the New Year, 5033. Instead, I’m on an exclusive cruise for millionaires with my men in tow, assigned to a high-profile criminal investigation. 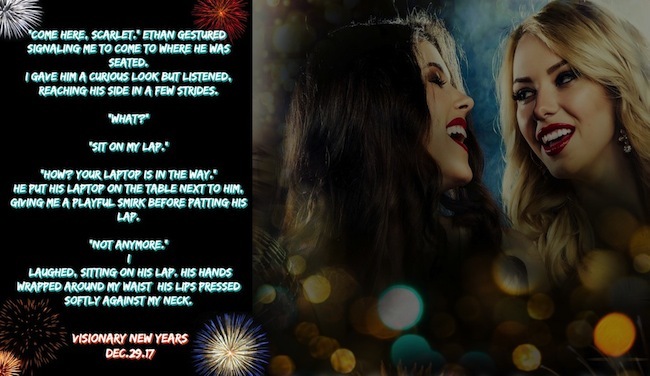 I, Scarlet Sinclair, was now undercover as Irina Locksworth, rocking a brunette wig and running for my life in a hot pair of not-so-running-friendly Louboutin’s, while praying our secret weapon didn’t fall out of my bra as we tracked down a drug lord, each tick of the clock pushing us closer to the New Year…and our deadline. Time for Team Seven of Paranormal INC to end this year with a bang. I just prayed to the gods it wasn’t also the end of us. Visionary New Years is apart of the Holiday Series and does not take place during the same timeline as the main series. It’s recommended to read VISIONARY INVESTIGATOR- Book One in the Paranormal INC Series to understand/enjoy this novel. Recommended for 18+ audience, containing mature sexual content, violence and strong language. 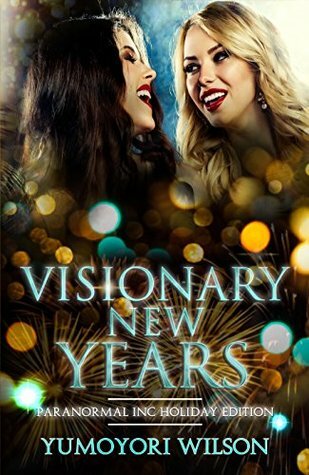 NOTE: Visionary New Years is written in CANADIAN ENGLISH (a mix of American and British English). “Hey, what you-” I began lifting my head to question his sudden movement when his lips met mine. I smiled, closing my eyes; returning the kiss. We kissed for what seemed like minutes when he pulled away; both of us out of breath. “Do I have to distract you before you stay still?” He asked. “I like distractions. Especially ones that require good kisses,” I replied. I pulled out of his embrace; changing position on the couch to face him. He lifted an eyebrow; confused as to what I was planning. “Now I can kiss you and you can work on my back.” I grinned. I love the attention-grabbing cover! I'd like to read this! Sounds like an exciting series. I love that it includes the holiday.